Bluetech is an amazing electronic artist. Typically when I think of “ambient” I think of some lame, slow, airy music. Bluetech’s music is often ambient, but still retains a crispy edge, you just got to love. 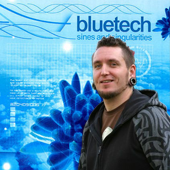 Bluetech is Evan Bartholomew (born 1976 or 1977) – a psybient DJ/producer who creates a varied selection of downtempo music. Bluetech’s music is very diverse, even for a psybient artist. He places significant emphasis on melody in his productions, and his works often demonstrate an influence from dub and ambient techno.